Since I retired I have spent up to a month each year fishing on the Muskegon River in Michigan. While many fishermen think that fishing every day is absolute ecstasy, fishing day after day can start to become work after a while and It is like running guide trips without getting paid. Early June on the Muskegon this year was a very different experience from my normal trips. Constant rains had raised the river to levels and current flows that I had never seen before on such a continuous basis. The fish were very cooperative, however, but not on wet flies. 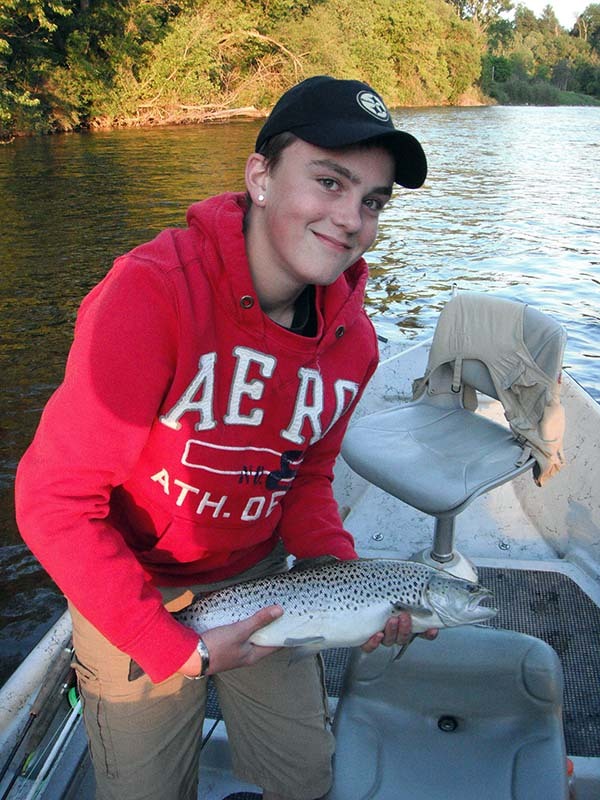 There were some great hatches and for almost two weeks dry flies produced almost all of the action including a 27-inch brown trout caught by my fourteen-year-old nephew (and prize pupil) on a parachute gray drake tied by his dad. In the last ten to fifteen years I have become a student and advocate of the wet fly as an excellent method of catching the trout that inhabit the rivers and streams of Michigan and Wisconsin. For whatever reason, dry flies were the way to go for this trip. 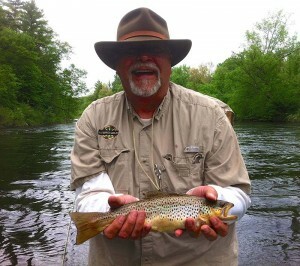 In many cases I have fished wet flies successfully when dry flies, streamers, nymphs and other methods of fishing have failed or come up short. This Spring and Summer I finally decided to go through as much of the literature on wet fly fishing that I could find to see if what I have learned over the years was anything close to what I was doing on stream. 2013 was tossing everything I knew and most of what I read right out the boat. “The cast he describes is up and across. When the fly sinks, follow it with the rod and don’t pull against it (its unnatural). When you think the (selected) fish is near, stop movement and lift the fly. The fish sees it, hackles start to work, fly continues to rise in the current with hackle working—fish takes it. Basically, simply allow the fly to advance with the current, check movement, fly rises and fish takes. The fly touches the water first. Fish the wet fly on the surface for a surface strike (flymph??). Leisenring used llight wire hooks not heavy nymph hooks for his “natural” flies. When I finished reading, Bob handed me an old chart from one of his fly fishing presentations (pictured above) and despite my extensive reading on wet fly fishing, I had forgotten one of the basic methods of fishing. Sometimes you have to separate the pearls from all of the gravel. Education complete I headed back to the river for practical application. The weather finally improved and the river began to clear up and receded to more normal flows. It was the middle of the week so we were mostly alone on the river. We started to drift though a run with fish rising in shallows on one side and deeper water on the other. The deeper water was at the bottom of a 10-20 foot slope. For some reason this spot appealed to me so I dropped anchor. My two partners began fishing to the rising fish and I decided to use wet flies on the deeper side. I tied on one of the flies pictured above and then also decided to put my new knowledge to the test. I carefully cast a short line upstream and followed Leisenring’s upstream technique above. I slowly raised the sunken fly in the water. As the fly floated past me a nice 14-15” brown trout literally jumped out of the water and took the fly. I do not know who was more surprised, me or the fish ! Why the surprise? Because all the visible activity was taking place opposite from the rising fish and I was not using the usual across and down method that I normally would use. I was not nymph fishing but using the wet fly “flymph” as intended.